Management Reports: Do-it-yourself reports for eLaw paid subscribers to keep track of outstanding motions, court deadlines and appearance schedules. Custom Reports: Customized On Demand Reports used by law firms, insurance/risk management companies and vendors to generate unparalleled insights to manage and grow their business. Management Reports allow eLaw paid subscribers to run their own reports using a variety of parameters. Court rules and litigation schedules are constantly changing. And missing appearances can be embarrassing and costly. The do-it-yourself Management Reports allow paid eLaw subscribers to get high-level and detailed views, such as outstanding motions that include their history. With future appearance reports, subscribers can view all of their appearances for any date range they select. Management Reports also feature the courts’ standard and goals on each case, a list of all notified parties and how many times a case has appeared on a trial calendar. All of the reports have the option of exporting the information in either a Microsoft® Excel® or PDF format. All customized reports can be saved as a template and run at any time in the future. Download the product sheet PDF for more information about Management Reports. eLaw maintains a proprietary database containing all the docket information from the New York Supreme and Civil courts. Subscribers can query this database with On Demand Reports to generate unparalleled insights to manage and grow their business. An On Demand Report can be run once, or it can be scheduled to run monthly, weekly, or even daily. eLaw's On Demand Reports are used by a wide variety of professionals. Party research - find all cases throughout the state in which a party has been involved in another lawsuit. Attorney research - find other cases in which your firm, opposing counsel or any attorney has ever filed an appearance. Medical provider - find all cases in which a client has brought suit against a medical provider. 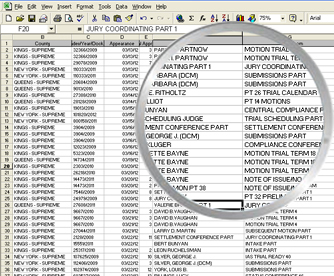 Case type - find all cases by case type, including all attorney information by county, and filed during a certain period of time. Funding companies - track the status of all cases involving the plaintiff or attorney that is the subject of your loan. Business development - view suits in which targeted clients are plaintiffs or defendants. Docket management - find upcoming appearances for your firm sent on a customized spreadsheet. Insurance companies globally track defense firms that represent their insured to accurately handle reserves and notifications on all future appearances, decisions and dispositions. Risk management companies use eLaw to monitor all the litigation involving the law firms handling claims to ensure instant notifications on all cases. Corporations use eLaw On Demand Reports on a daily, scheduled basis for a first-warning of being a named defendant, and also to monitor and manage the firms which represent them by benchmarking their appearances, decisions and case status. All cases in which a law firm is involved, by type of case. Cases that have reached a specific point in litigation, such as RJI filings. Notes of issue filed and trial calendars. eLaw's On Demand Reports are delivered as CSV files, which can be opened in spreadsheet, database or document applications.